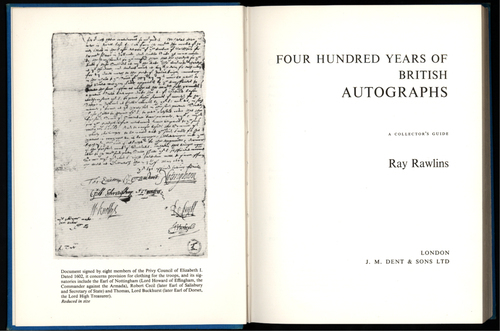 Four Hundred Years of British Autographs. A Collector’s Guide. 188 pp. Blue cloth, in fine bright condition, with original dust wrapper. Over 400 facsimile signatures, including every British sovereign from Henry VIII, some 49 prime ministers, and a wide range of literary figures, soldiers, scientists, artists and others. London, 1970. This remains one of the most useful and reliable books about autograph collecting.